Shane Beros began his football with the WAAFL in 1996 with West Coast Amateur Football Club. He spent two seasons with West Coast, representing the state in both years before being recruited to the Swan Districts Football Club In 1998 he made his debut for Swan Districts playing 18 games and kicking 11 goals. He finished his WAFL career in 2008 with 193 games to his name and kicked 112 goals. He won the 2003 Sandover Medal and finished runner up in 2004. 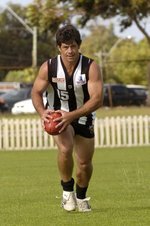 He won two Swan Medals as Swan Districts Best and Fairest in 2003 and 2005. Shane was also Captain of the Swan Districts Football Club from 2004-2007. Shane represented Western Australian four times from 2003-2006. In 2009 Shane joined the Mount Lawley Amateur Football Club where his brother Damon was playing. He assisted Mount Lawley in winning the B Grade Grand Final which allowed them to be elevated into A Grade the following year. He won the WAAFL B Grade Fairest and Best and was judged as the Best on Ground in the Grand Final. In 2010 he coached the Mount Lawley A Grade side finishing just one game out of the finals. He returned to coach the side again in 2011 finishing on top of the ladder before losing the Grand Final to University. This Grand Final appearance is the best A Grade effort for Mount Lawley since their run of premierships in the late 80’s and early 90’s. Shane is an ambassador for the Swan Districts V Swans Program and often returns to Mount Lawley to take old footballs, boots and clothes with him for the kids in the Pilbara. The WAAFL inducts Shane Beros into the Hall of Champions as a High Achiever.